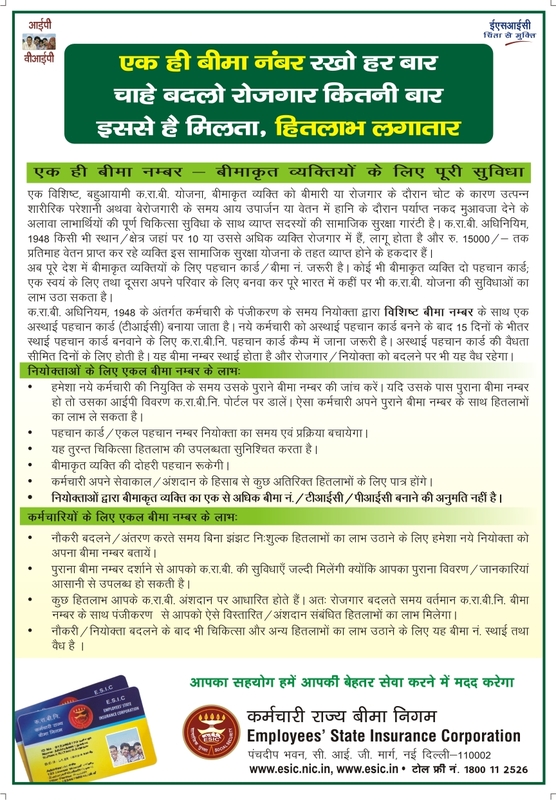 Circular Dated 21.12.2012 from Med.VI Branch on the subject : Doubling of existing rate of Payment of Hospital Patient Care Allowances/Patient Care Allowances to eligible Group 'C & D'(Non-Ministerial) employees working in Hospitals, Dispensary and Organitation w.e.f. 01/09/2008. Circular Dated 26.12.2012 from A/cs-III Branch on the subject : Registration of DDOs for payment of Service as per Reverse Change Method. Circular Dated 27.12.2012 from Med.V Branch on the subject : Amendment in RC No. 136-reg. Circular Dated 24.12.2012 from N.T.A Branch on the subject : Induction Training for Direct Recruit SSOs/Managers/OS’ - 2012 atESIC NTA, Delhi (7th January to 23rd January 2013). Circular Dated 19.12.2012 from E.III Branch on the subject : Payment of Honorarium to Officers & Staff of ESI Corporation -regarding. Circular Dated 17.12.2012 from E.IV Branch on the subject : Provisional Gradation/Seniority List in respect of Specialists Gr.II(Sr. Scale) in the various Specialities in the pay scale of Pay Band-3 + 7600/- as on 31/05/2012 in the ESI Hospitals under ESI Corporation. Circular Dated 30.11.2012 from E.I Branch on the subject : Quarterly Statement of officials in the cadre of SSO/Manager Gr.II/Supdt. 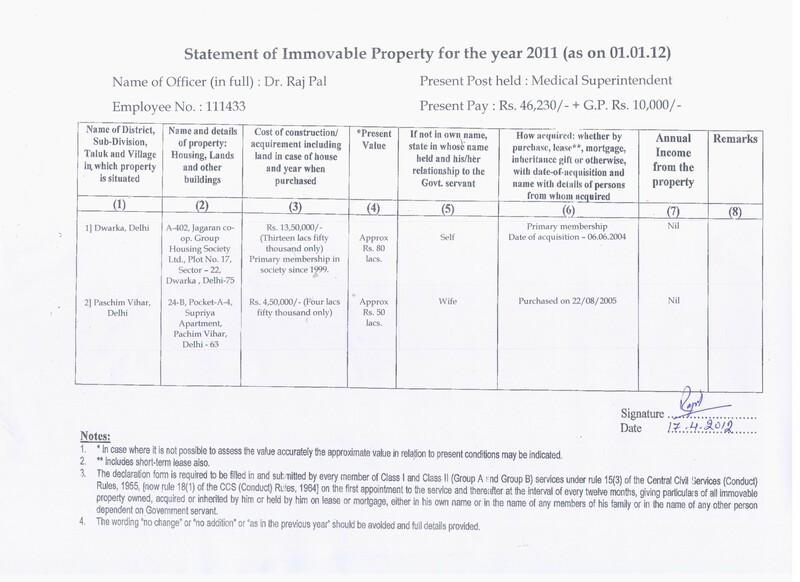 2349/2012 Letter Dated 23.11.12 from ESIH Rohini, New Delhi : Allotment of Type I and Type II Staff Quarter Situated at ESI Hospital,Sec 15 New Delhi . 2341/2012 Memorandum Dated 04.12.12 From E.I Hqrs branch on the subject : Schedule for General-Elections to Legislative Assemblies of Gujarat & Himachal Pradesh (H.P.) -Enforcement of model code of conduct. 2336/2012 Letter Dated 06.12.12 ,From NTA on the subject :Functional Training/Workshop on Benefit Matters for Benefit Branch Officers & Grade-I Managers of North and East Zones - at Kolkata on 16, 17 and 18th January 2013 . 2321/2012 Circular Dated 23.11.2012 from ESIC, HQRS ,New Delhi From RTI branch on the subject : Quarterly Return regarding implementation of the the RTI Act,2005. 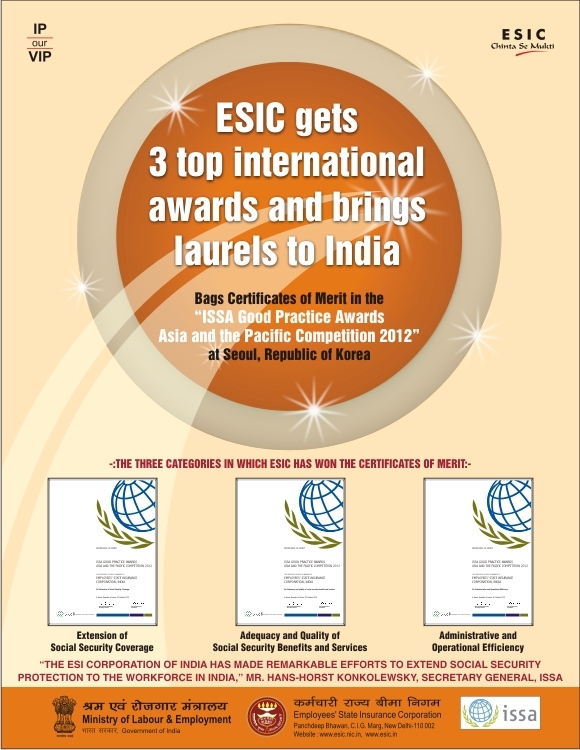 2305/2012 Circular Dated 09.11.12 from PR Branch on the subject : ESIC bagged 03 Certificates of Merit in the "ISSA Good Practice Awards, Asia and the Pacific Competition, 2012". 2269/2012 Letter dated 15.10.2012 from ESIMH, Bari Brahmana, JK on the subject : suo-moto disclosure u/s 4 of the RTI Act,2005. 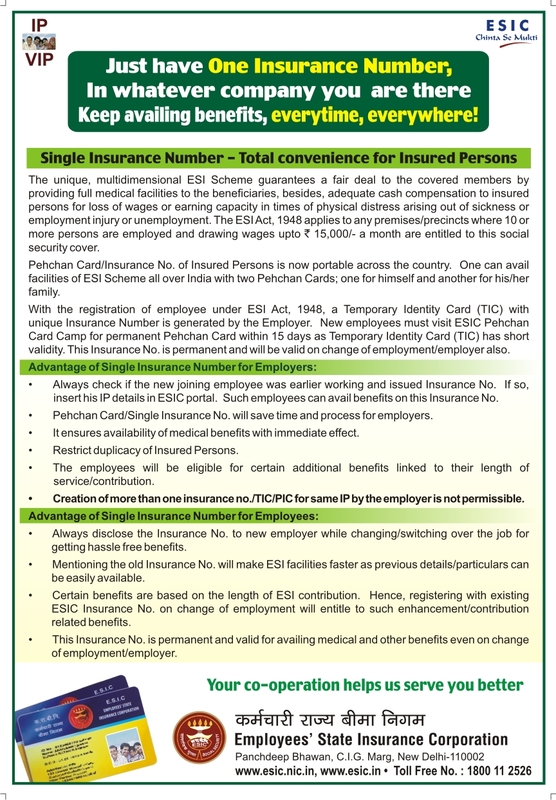 2268/2012 Circular dated 11.10.12 from E-VI branch on the subject : ESIC Pensioners Medical Scheme - Modification in Pensioners Identity Card, Medical Card. 2263/2012 Circular dated 12.10.12 from PR branch on the subject : Creation of Multiple Nos. of TICs / IP Nos. regarding. 2256/2012 Circular dated 27.09.12 from PR branch on the subject : Uniformity in use of ESIC logo. 2242/2012 Letter dated 03.10.2012 from NTA on the subject : 3 day's training / workshop on Preventive Vigilance at Bangalore and Kolkata. List of Participants (West & South Zones). 2237/2012 Letter dated 28.09.2012 from ESIMH, Bari Brahman, J & K on the subject : suo-moto disclosure u/s 4 of the RTI Act,2005. 2181/2012 Memorandum Dated 30.08.2012 from E-I branch on the subject : Revised Gradation/Seniority List of Officers in the grade of Regional Director Gr. 'B'/Joint Director in the pay Band of Rs. 15600-39100 + Grade Pay Rs. 7600/- as on 01.04.2012. 2177/2012 Letter dated 27.07.2012 from ESICH, Parippally, Kollam, Kerala on the subject : suo-moto disclosure u/s 4 of the RTI Act,2005. 2171/2012 Circular dated 24.08.2012 from PG Branch on the Subject : Minutes of the meeting held on 27.07.2012 at 4.00 PM on Public Grievance experience sharing in Conference Hall, ESIC Hqrs Office. 2151/2012 Circular dated 09.08.12 from E-I branch on the subject : Confirmation of details of SSo/Mgr. Gr.II/Suptd. 2147/2012 Office Order No. 134 of 2012 Hqrs. Office from E-I Branch dated 09.08.2012. 2131/2012 Office Order No. 132 of 2012 Hqrs. Office from E-I(Vol.II) Branch dated 09.08.2012. 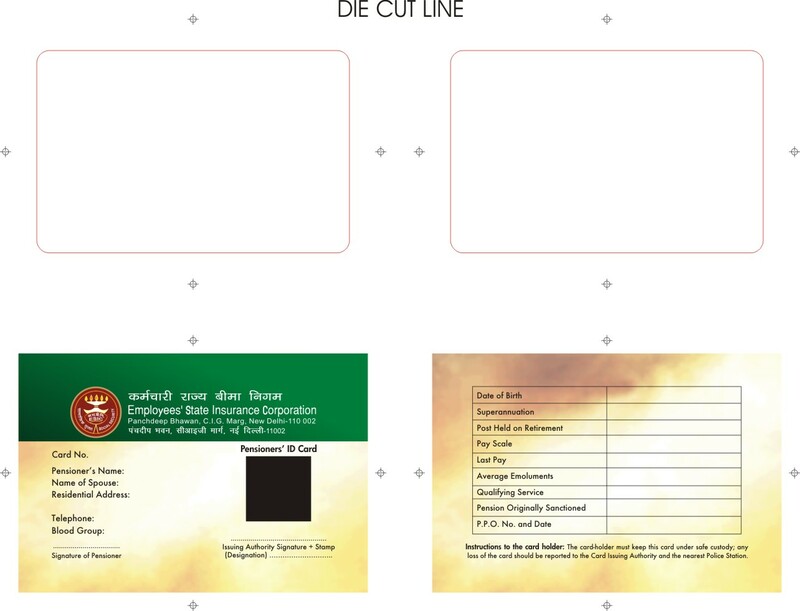 2122/2012 Circular dated 03.08.2012 from PR Branch regarding for using/displaying new Logo/Signboard/Direction Board / Panel. 2111/2012 Memorandum Dated 19.07.12 from E-6 branch on the subject : Preparation of Budget Estimates for 2013-14 and Revised Estimates for 2012-13. 2106/2012 Circular dated 26.07.2012 from Administration Branch on the Subject : Shri Anil Kumar Agarwal,IAS(WB:81) has assumed charge of the post of Director General in the ESIC, New Delhi in the afternoon of 26th July, 2012. 2094/2012 Letter dated 20.07.2012 Public RelationBranch onthe Subject : Handbook-ESIC Medical Services Hospitals(Non-Receipt). 2093/2012 विषय पर स्था-1 द्वारा पत्र जारी दिनांक11.06.2012 दिनांक 01.04.2012 की स्थिति के अनुसार ग्रेड वेतन 4800/-रु.के साथ वेतन बैंड-2 (9300-34800/रु.) मे सहायक निदेशक / प्रबंधक ग्रेड-1/अनुभाग अधिकारी की श्रेणी मे अधिकारियों की अनंतिम पदक्रम / वारिष्टतासूची . 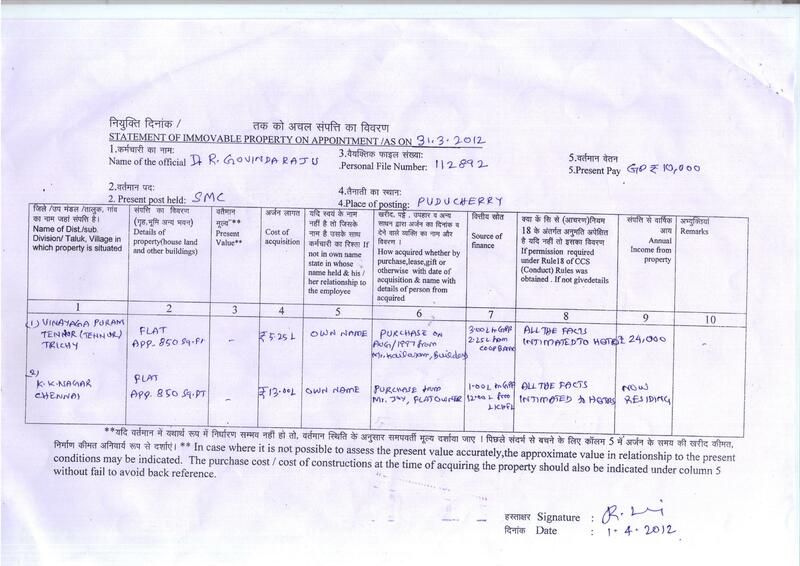 1020/2012 Statement of immovable property return byofficers of Group Á'as received from Vig.Branch on 26.04.2012 in r/oS/Sh. 1013/2012 Office Order No.69 dated 26.04.2012regarding promotion of Assistants/ Head Clerks to the cadre of SocialSecurity Officer / Manager Gr.II / Supdt. 950/2012 Letter dated 16.03.2012 from VigilanceBranch on the subject Provision of information under RTI Act. 905/2012 Circular dated 1.03.2012 on thesubject historicdecisions taken touching the lives of millions of our insured persons. 894/2012 Circular dated 13.03.12 on thesubject. : Combined Regional, Director/Directors/jt.Directors (I/c)/SSMCs/SMCs/MSs conference to be hel on 20th and 21stApril,2012-reg. 893/2012 Circular dated 06.03.2012 issued from GeneralBranch regardingengagement of Security Agencies. 866/2012 ESIC Hqrs. on the subject 15 LokSabha and Rajya Sabha ofthe10th session of the 255 Prasno during the session toanswer inrespect of the allocationof days. 865/2012 ESIC Hqrs. on the subject Regarding-raisingof DOP of MSs/SSMCs/SMCs for procurement of Medical Equipments fromRs.15 lacs. to 25 lacs.per unit. 864/2012 ESIC Hqrs. 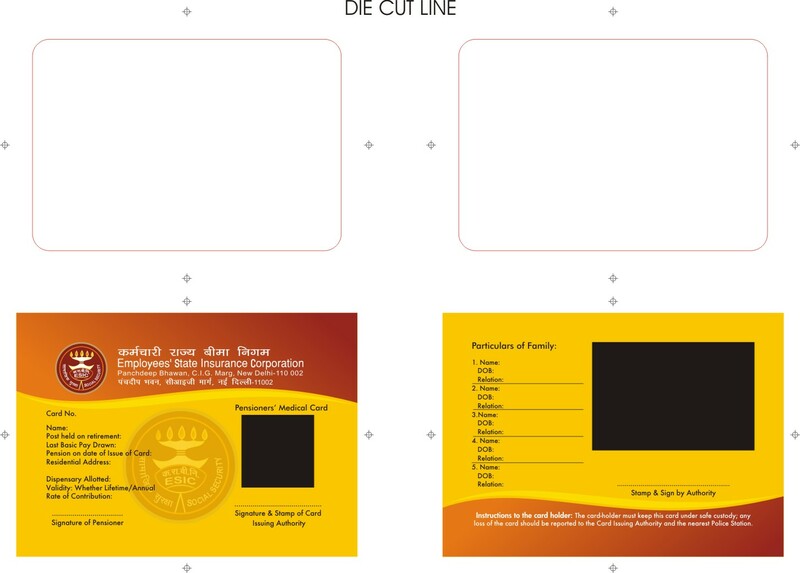 on the subject Enhancementof Minimum amout for the Dependant Benefit as Rs.1,200/reg.